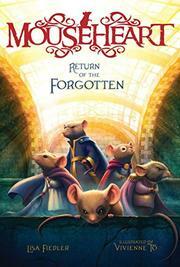 In this final volume of the Mouseheart Trilogy, warrior mouse Hopper seeks his estranged brother while a new traitor threatens the peace of underground Atlantia. Since defeating the feral cats, Hopper and his rat friends, Zucker and Firren, have rebuilt Atlantia in Brooklyn’s subway tunnels into a visionary rodent colony. Hopper’s the proud godfather of Zucker and Firren’s daughter, Hope, and his sister, Pinkie, ruler of the Mus, has mellowed. However, his embittered, younger brother, Pup, avowed enemy of Atlantia, has vanished. Unaware that Pup regrets his past behavior and seeks forgiveness, Hopper and Pinkie organize a search party. Meanwhile, Pup’s captured by Devon, one of Pinkie’s elite guards. Consumed with a thirst for vengeance against Firren for past deeds, Devon kidnaps Hope and threatens to use her and Pup to punish Firren. When Pup and Hope discover Devon’s dark plan, they escape and journey aboveground for help from Hopper’s old pals. As Hopper and his friends rally, Pup and Pinkie make their way across the East River to confront Devon. While Volume 3 focuses on Pup’s redemption and Devon’s despicable deeds, the return of familiar characters, added Mus back story, atmospheric illustrations, and romance for Hopper should delight readers.